Since 1991, the International Day of Older Persons is being observed annually on 1 October under the auspices of the United Nations. The Day has a different theme every year and the theme for 2016 was “Take a Stand Against Ageism”. Ageism is defined as stereotyping and discrimination on the basis of a person’s age. Ageism may not be a very commonly used word, but as a practice it is already widespread. Older people are considered unsuitable for jobs, regarded unfit for insurance, given lesser importance in society, and discriminated against in this rapidly changing world. Even climate change seems to be working against older people. Rising temperatures, increasing humidity, deteriorating air quality, are some of the causes that are adding to the woes of older people. They are now more susceptible to heat stroke, dehydration, arthritis, asthma and many other diseases. Recent data on the correlation between climate indices and deaths due to these causes shows that it is much higher for older persons than for younger persons. The reason for such a statistical bias in climate-related happenings lies in ageism. Because by nature ageism results in marginalizing older people and keeping them out of the mainstream community life. This happens particularly when old people are an isolated part of huge families or when they live on their own in urban residential complexes. For example, on an exceptionally hot weekend, the younger generation may go to refresh themselves on beaches or mountain resorts, or plunge into swimming pools, while the old are left behind to fend for themselves. Many times they may not even be aware that there was an heat wave in their region. Even if they were, they may not know how to cope with it. On the other hand, there are many older people who do not believe in climate change and do not care about it. They have seen it all in their lifetime, they say. They recall having experienced worse situations and the future scenarios painted by climate change scientists do not scare them. Either way, there is only one solution to the problem and that is: As you grow older, you must try to be wiser! Then you can defy ageism and enjoy the pleasure of living your own life on your own terms! 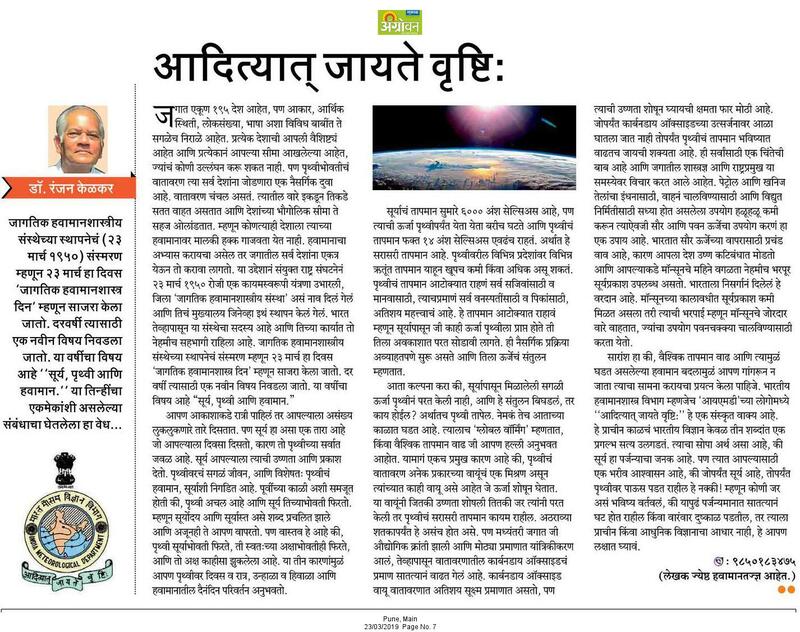 An article in Marathi about climate change by Prof, R. R. Kelkar was published in Maharashtra Times, Pune, on 13 Dec 2015. Click on the image to read the pdf file. Is truth negotiable? No, for if it were, it would no longer be truth. Is science negotiable? Of course not, otherwise it won’t be science. But is justice negotiable? Very much indeed! The very process of arriving at justice is based on negotiation. Justice can be discussed, bargained for, modified or even reversed, depending upon how a case is fought or how mercy is sought. Climate justice, like any other form of justice, is negotiable. Climate science, unlike other branches of science, is also negotiable. All put together, the issue of climate change has always been a subject of seemingly endless negotiations. The 21st Conference of Parties would continue with these negotiations at Paris in December 2015. The aim is to hammer out an agreement that would be acceptable to all parties. In the meantime, individual countries including India have already released their plans and ideas about how they hope to achieve this. 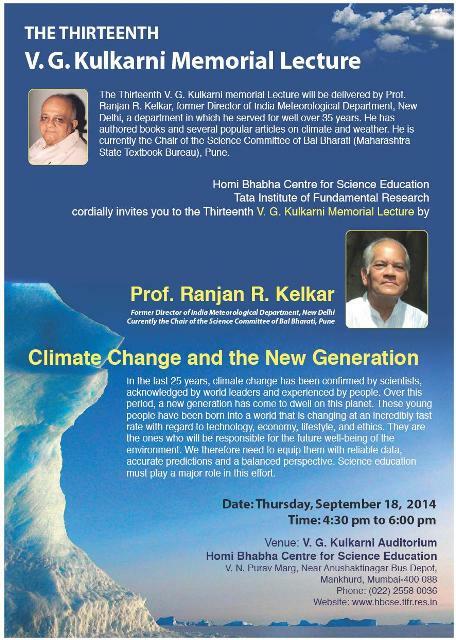 India’s climate change plan talks about climate justice. The problem with climate justice is that the laws are non-existent, the evidence is hazy, there are no jurors, and the court consists of the litigants themselves, whose concept of justice is to extract as many pounds of flesh from each other as possible. Climate justice lies in a promise by all countries to “sin no more”. But we do not see that happening. Most countries want many more years to continue with their climate sins before they can stop them. Some countries are willing to tone down the degree of their climate sins, like allowing the earth to warm by 2 deg instead of 4 deg over the next century. Is there justice in nature? Not at all. God’s design of nature is based upon diversity and not on equity. Carbon dioxide is just 400 parts per million of the atmospheric volume, but it is driving the earth mad! Nitrogen is 80 per cent of the atmosphere, but it makes no difference. Yet nitrogen, oxygen, ozone, water vapour, carbon dioxide, all have a place in God’s scheme of things. Why should Cherrapunji receive 1100 cm of rain in a year and Jaisalmer only 20 cm? Is it fair? No, but we cannot introduce equity here. That is nature as God has given us. For most people on earth, contributing to climate justice means planting a few trees or participating in a marathon on a cheerful holiday morning. For some governments, climate justice lies in making petrol cheaper and then enforcing a no-car day once in three months. This is not climate justice. God allowed man to use his creation but man is misusing it. The “sin no more” command applies to the human misuse of God’s creation. If we do not heed that command or if we try to dilute it, or overlook it, God’s justice will be delivered in the fullness of time.